Make sure the trunk/root flare is exposed and above the soil level. I don't recommend water rings. 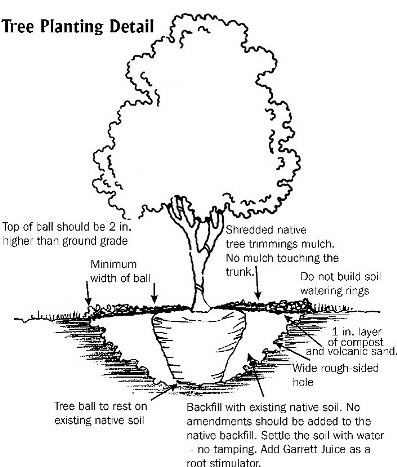 If trees are planted using natural techniques, if the planting hole is backfilled with soil that was dug out to create the hole, and if the tree is watered thoroughly at planting time, additional water other than that used on surrounding plants is rarely needed. Deep watering twice a week is almost always too much. Many more trees die from too much rather than too little water. Question: In January, we hired landscape professionals to plant two live oaks. The workers did not cut the wire or burlap from around the root ball. They told us not to water for three weeks. When we did water to add root stimulator, the trees immediately began to die. Last week, the workers came back and planted two replacement trees. These live oaks are about 12 feet tall, and again the workers did not cut the wire or turn back the burlap. Answer: The burlap should be removed. There will usually be some excess soil under the burlap on top of the root ball. That soil also should be removed. The only root stimulator I recommend is my recipe for Garrett Juice (see Resources to request handouts).